NATO ring - 24 "
Holder under NATO ring - 22"
I can allow for a bit of nose down height .. but not 8"
If I did something like this .. would it be strong enough ? What I have done is to remove the ring/plunger shaft which on my trailer is 45mm o/d and had an engineer friend machine me a new plunger (out of solid chromed 45mm bar) but with 2 holes at the receiver/ring end to take an E marked Knott NATO bolt on ring hitch. I carry a 50mm ball hitch of the same bolt pattern and in an emergency for 2 bolts and I can be rescued!! It does help a little that my trailer has a stepped drawbar, but a friend has done the same on a standard sankey and it gets him home! Smaller alloys? May give you a few inches to reduce the step down God created heavy armour on 06 sept 1916, on the 7th the devil stood to attention! 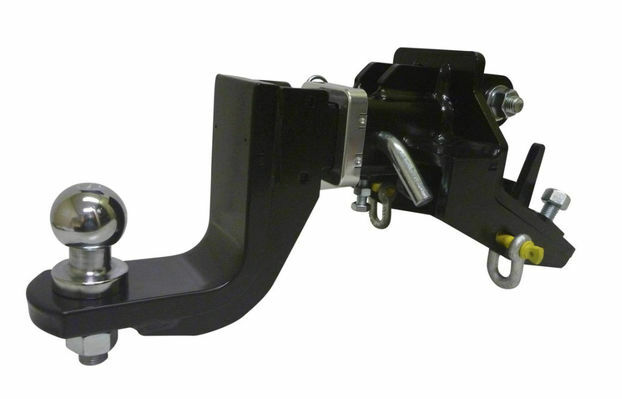 Just throwing this one out there, what about permanently adopting the trailer to a lower hitch height like done before? Still keep nato hitch but easier to adapt? This might be too complicated to be practical but one could build a dolly that hitches to a 50mm towball. On the dolly would be a frame that carried a NATO hitch at the appropriate height. The Sankey (or whatever) would then become a four wheel draw bar trailer. These used to be subject to a 30mph speed limit but one sees them nowadays frequently travelling at much higher speeds. Always plan ahead - it wasn't raining when Noah started building the Ark. Adrian if this is purely for a recovery truck use in case of breakdown? Club skip ya lockers !!! Club BAS remote heater !! Wouldn't it be easier to do something like this? Would adapting/manufacturing something like this be an option? Could you not rotate the tow hitch in the receiver by 180 degrees and then put the tow ball back on? It might not give you 8" but might take you some of the way there? Front Runner Rack, OEM Ladder & RAI, Tuff-Trek Foxwing, B'rakhah Ingonyama Expedition Trailer, RLD's Spare Wheel Protector, Bodsy's Bars, Empty Pockets! Member of Gloucestershire & Worcestershire 4x4 Response. Scrap that. Just re-read your post Front Runner Rack, OEM Ladder & RAI, Tuff-Trek Foxwing, B'rakhah Ingonyama Expedition Trailer, RLD's Spare Wheel Protector, Bodsy's Bars, Empty Pockets! Member of Gloucestershire & Worcestershire 4x4 Response. if it's for recovery only ... what's the OTHER end of the trailer like ? could you bolt something to chasis there that could take a standard tow socket? Dean. Would the height to your D4 matter because you can adjust the height on a recovery truck tow hook ! you just need the NATO ring to ball coupling conversion to keep with you just in case ? 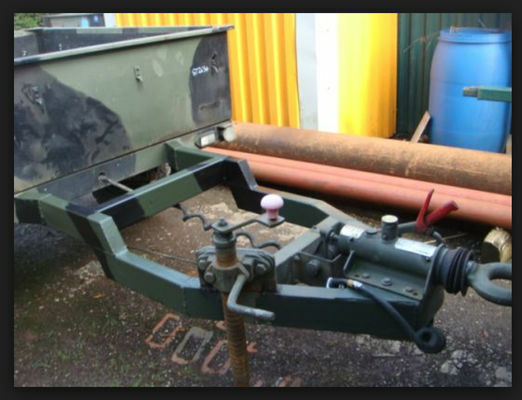 This might be too complicated to be practical but one could build a dolly that hitches to a 50mm towball. On the dolly would be a frame that carried a NATO hitch at the appropriate height. The Sankey (or whatever) would then become a four wheel draw bar trailer. These used to be subject to a 30mph speed limit but one sees them nowadays frequently travelling at much higher speeds.